, an ingenious Frenchman, was born at Clameci, of a good family, in 1635 and was educated at Nevers, Auxerre, and Paris, and lastly studied divinity in the Sorbonne. In the mean lime, he cultivated the art of painting, which he was supposed to understand in theory as well as practice. The former accomplishment led him to an acquaintance with du Fresnoy, whose Latin poem upon painting he translated into French. Menage also became acquainted with his great merit, and procured him, in 1652, to be appointed tutor to the son of Mons | Amelot: in which he gave such satisfaction, that, when his pupil was old enough to travel, he attended him to Italy. 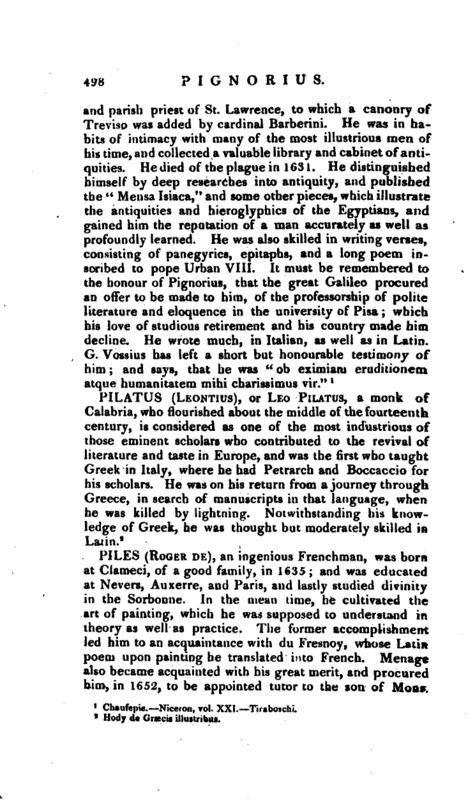 There he had an opportunity of gratifying his taste for painting; and upon his return to Paris, he devoted himself to the study of that art, and soon acquired a name among connoisseurs. In 1682, Amelot, his quondam pupil, being sent on an embassy to Venice, de Piles attended him as secretary; and, during his residence there, was sent by the marquis de Louvois into Germany, to purchase pictures for the king, and also to execute a commission relating to state affairs. In 1685, he attended M. Amelot to Lisbon; and in 1689 to Switzerland, in the same capacity. In 1692, he was sent to Holland, apparently as a picturecollector, but in reality to act secretly with the friends of France. 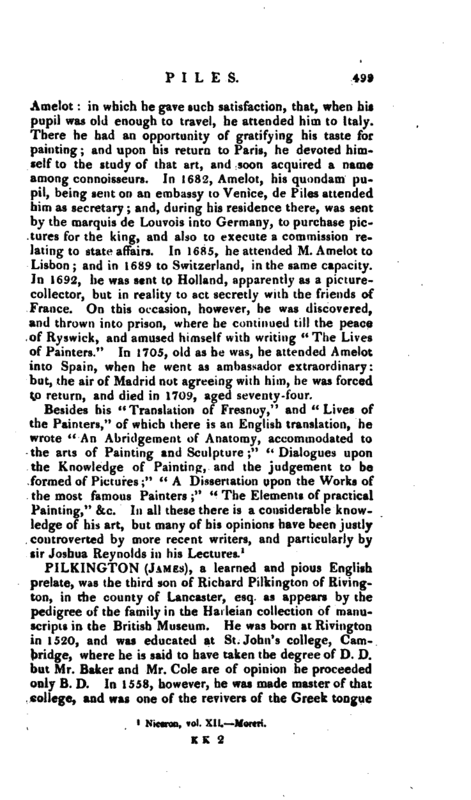 On this occasion, however, he was discovered, and thrown into prison, where he continued till the peace of Ryswick, and amused himself with writing “The Lives of Painters.” In 1705, old as he was, he attended Amelot into Spain, when he went as ambassador extraordinary: but, the air of Madrid not agreeing with him, he was forced to return, and died in 1709, aged seventy-four. Niceron, vol. XI f. —Moreri.